Lead Guitar Lessons - Guitar Vibrato. Free Lead Guitar Lessons! Vibrato is an essential technique used in playing lead guitar. To use vibrato the string is vibrated by bending and releasing the string rapidly with your fret hand. I talk more about bends and bending on my free Guitar for Beginners page. Vibrato is really easy to do but each player has their own style. Figure 1 and 2 show you the difference between a note played regularly and a note played using vibrato. Try all 4 lessons and learn to play guitar vibrato. 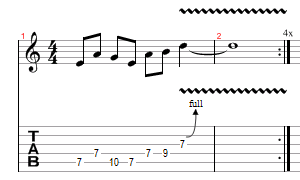 This vibrato riff uses the E Pentatonic Blues Scale. Vibrato is commonly used at the end of riffs or phrases to help the note sound more full. This time try using vibrato with a bend to the E Minor Pentatonic Scale riff. Bend the last note up a full step and then use vibrato. Check out the rest of the Lead Guitar Lessons and learn to play the guitar!